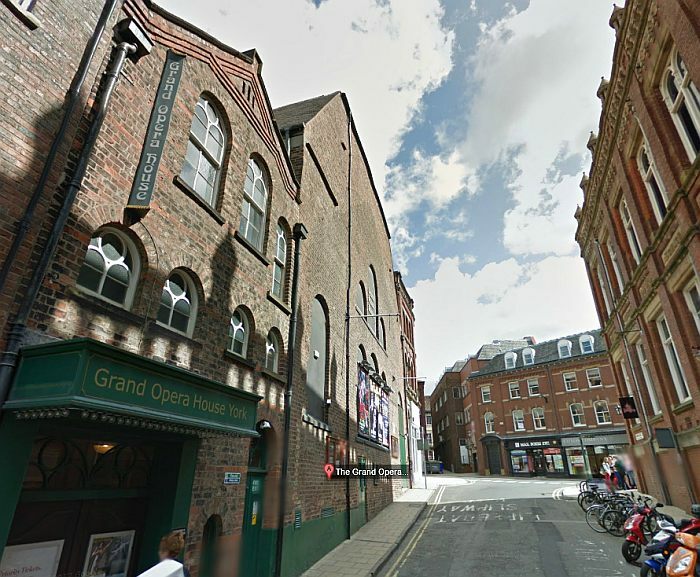 The Theatre Royal in St. Leonard's Place, York has an extremely long history. In 1744 the first Theatre, called the New Theatre, was built on the site of a former medieval hospital called St. Leonard's. 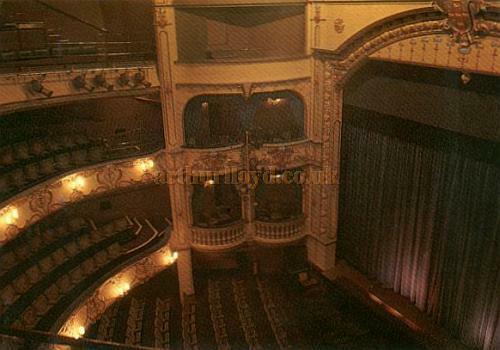 Right - Auditorium of the present Theatre Royal, York - From a Postcard - Courtesy Alan Chudley. This Theatre was reconstructed in 1765 and four years later it was granted a Royal Patent and the name was changed to the Theatre Royal. The Theatre was at this time under the management of Tate Wilkinson and Joseph Baker; Wilkinson becoming the sole manager after Bakers death in 1770. Wilkinson was famous for his memorable creation and management of the York Circuit. Although this Theatre no longer exists as a whole, over the years there have been many reconstructions but never total demolition so that the present Theatre Royal consists of the fabric of a succession of alterations from many periods. The rear of the Theatre still contains the frontage of a Georgian house, yet the Victorian stone Facade of the current Theatre is from 1880. There was a major rebuild in 1902 and the auditorium, with a capacity of 1,300 and built on four levels with three shallow balconies of only six rows each; and the stage of the current Theatre date from this period. The plasterwork is mostly in the Art Nouveau style with some baroque features on the lower boxes. Electricity was installed at this time, replacing the former Gas Lighting throughout the Theatre. In 1967 there was some major refurbishment of the Theatre carried out when the Stalls were reorganised into continuous rows and the rear of the auditorium was partitioned off so that new cloakrooms and an exhibition space could be provided. This resulted in a reduction of the seating capacity from 1,300 to a more modest 899. At the same time a new Foyer, Restaurant, and Bars were added next to the Theatre, designed by Patrick Gwynne, which, although in a far more modern style of glass and concrete, complimented the more austere look of the building they were attached to. This new addition also served as the main entrance to the Theatre and gave access to all levels by a staircase attached to what was previously the exposed side elevation of the original building. The dressing rooms and workshops were also reconstructed and modernised at this time. 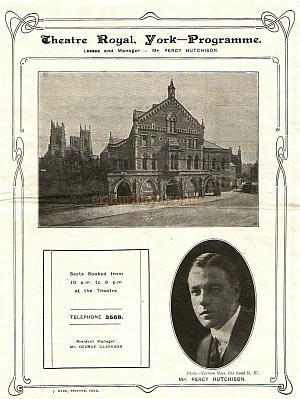 Right - Programme for 'Tilly of Bloomsbury' at the Theatre Royal, York in 1926, with a photograph of the manager at the time, Mr. Percy Huthinson. A visitor to this site, Ronald Nicholson, who was Chief Electrician at the Theatre Royal, York from 1965 to 1969, has sent in some photographs of the Lighting Desk at the Theatre during his time there. The Desk, or Board as they used to be called, was a Strand Electric System LP (Luminous Preset) Board, with 100 thyristor dimmer channels, with 3 presets and 2 groups in each preset, plus two rotary controls that any group could be assigned to, and a master fader for all FOH spots. 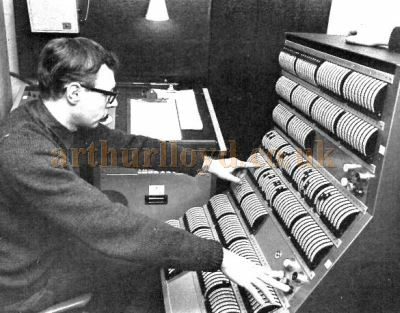 Left - Ronald Nicholson at the controls of the Strand Electric System LP Board of the Theatre Royal, York in the 1960s - Courtesy Ronald Nicholson. The two people you can just see through the window in the photograph are Donald Bodley, the Theatres director (left), and the production manager Peter Clayton (right). Ronald says that the Board was very versatile and easy to operate and maintain. It was originally installed in the Upper Circle but as part of the renovation it was moved to a Control Room at the back of the dress circle which was constructed in what was a disused staircase to the Gallery. The builders had to knock through a two foot thick wall to fit a window but Ronald says it gave a great view of the stage. The sound equipment was also moved to the same area at the same time. 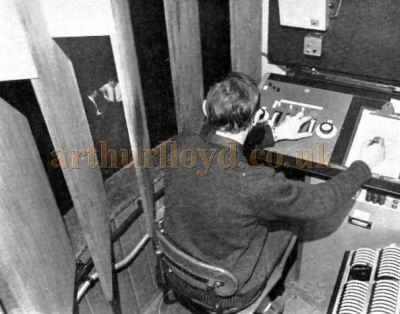 Right - Ronald Nicholson at the controls of the Strand Electric System LP Board of the Theatre Royal, York in the 1960s - Courtesy Ronald Nicholson. In 1979 the auditorium was redecorated, removing the 1967 green colour scheme and replacing it with brown cream and gold. In 1992 the Upper Circle was re-seated to give a more comfortable experience for its patrons and the Theatre's capacity was consequently reduced to 863. 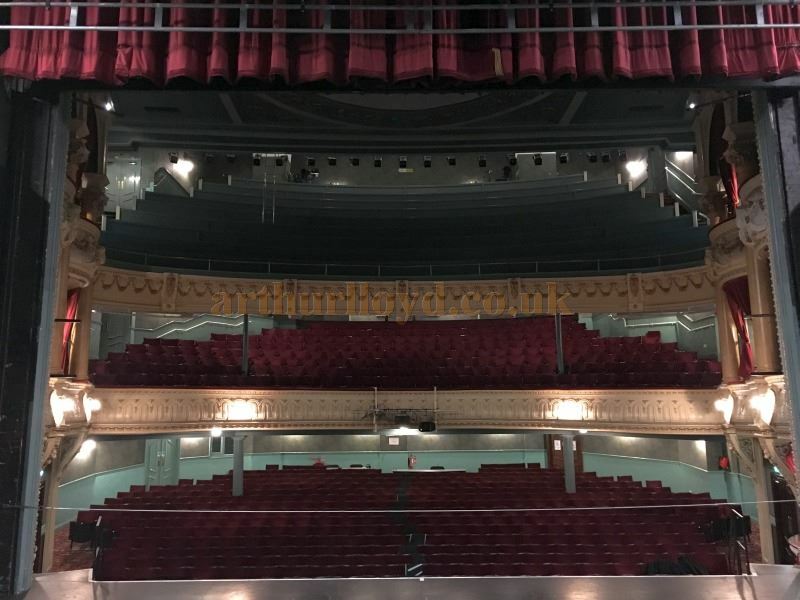 In 1994 the auditorium was again redecorated, this time in green, white and gold, and the seating was re-upholstered in dark red, whilst new carpets and a specially designed chandelier were also fitted. In 1999 a new space called the Keregan Room was added to the Theatre's amenities, and was a conversion from the undercoft of the previous building on the site, the medieval St. Leonard's Hospital. In the Spring of 2016 the Theatre Royal reopened after a £6 million refurbishment by the architects De Matos Ryan, some details of which can be seen here and here. 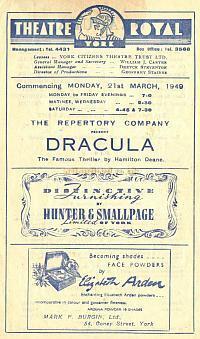 Right and Below - Details from a Programme for 'Dracula' at the Theatre Royal, York in March 1949 - Courtesy Alan Chudley. Arthur Lloyd is known to have performed in York in 1867, and his father in law, T. C. King is also known to have performed in York and the Theatre Royal on several occasions. You may like to visit the Theatre Royal's own Website here. 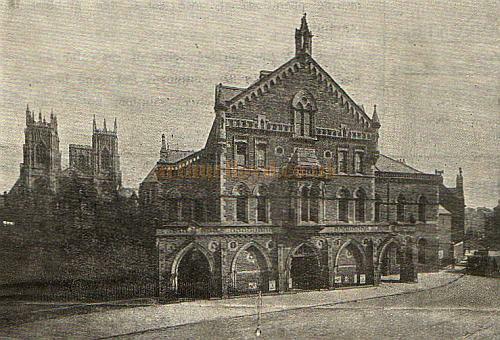 The Grand Opera House in Cumberland Street, York was originally built as a Corn Exchange and warehouse in 1868 and was subsequently converted into a Theatre by J. P. Briggs for the owner William Peacock in 1902, the same year that the Theatre Royal was being rebuilt. The Theatre opened on January the 20th 1902 with a production of 'Little Red Riding Hood' which starred Florrie Ford. Above - The New Grand Opera House, York - From a drawing by John F. Briggs, the Theatre's architect in the Playgoer of 1902 - Courtesy Iain Wotherspoon. The Playgoer of 1902 ran a small article about the new Theatre saying: 'York's New Theatre - Not the least important of handsome provincial playhouses will be the new New Grand Theatre, which Mr. F. Sheppard is building for Messrs. peacock, Raworth & Wilson, of the Opera House, Harrogate, at a cost of about £20,000, on the site of the old Corn Exchange in the heart of the ancient city of York. Mr. S. K. Sheldon is Clerk of the works. Of noble proportions, the building is constructed chiefly of red brick and terra cotta, and will be dominated by a stately tower. The unique decoration of the auditorium will represent Wedgwood china, whilst the electric lighting, heating ventilation, and safety fire appliances will all be of the most approved and up-to-date character. It is intended to open the theatre in December in time for pantomime.' The Playgoer of 1902 - Courtesy Iain Wotherspoon. 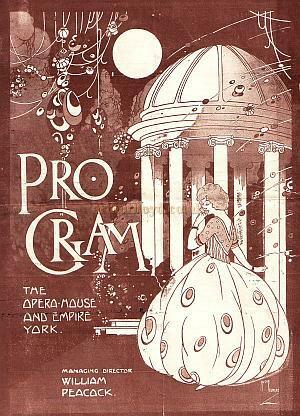 Right - Programme for 'Say When' at the Opera House and Empire, York in August 1925. The Theatre was owned and run by William Peacock and his family right up until 1945, and put on a great variety of productions including Music Hall, Pantomime, Variety, Opera, Plays, and even some of the early Silent Films. The rear wall of the auditorium on King Street is actually that of the original warehouse of 1868 and the rear wall of the stage on Cumberland Street still retains the arched windows of the original Corn Exchange Hall. 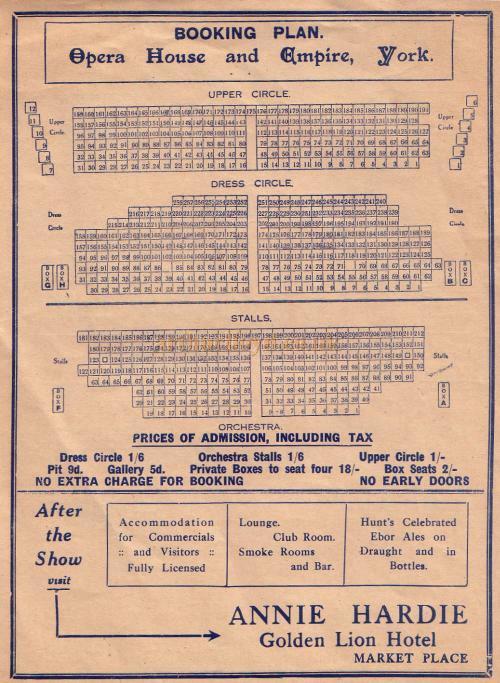 Left - A Variety Programme for the Opera House and Empire, York in May 1934, with The Empire Orchestra, Tommy Handley & Co in his sketch 'Radio Revels,' Clapham & Dwyer in 'Another Spot of Bother,' The Fayre Four in 'Soft Lights and Sweet Music,' Duncan Gray 'Accused of being Funny and found Guilty,' Jack Le Dair the Comedy Comedian, Mabel Marks the Radio Peppy Personality Comedienne, Neddy the lovable Donkey, and Marcel & Minks the Parisian Dancers. The Theatre's main entrance is through an arch fitted into a row of shops which were also part of the Corn Exchange rebuild. The auditorium is built on three levels, Stalls and two Balconies with two boxes either side on each level. In 1903 the Theatre was renamed the Grand Opera House and Empire, apparently so that smoking would still be allowed in the Theatre, which was not allowed in serious Theatres of the time. It was not unusual for a theatre to have two names i.e. Empire for Variety and The Grand Opera House for Stage plays. A Stage Play license would usually allow a licensed bar, which was not always the case with a Music, Singing, and Dance license for Variety only. As a Butterworth Theatre the Empire, as it was now known, descended the scale to a number two Variety House, but just as when it was a Peacock house, the occasional Number one musical was still presented once nightly. 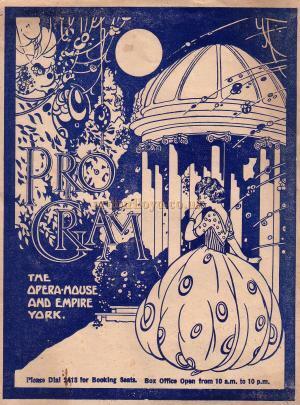 Right - Programme for 'The Belle of New York' at the Empire Theatre, York. 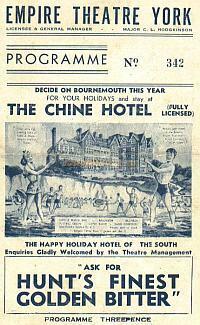 Note the advert for Freddie Butterworth's Chine Hotel in Bournemouth, which was shown on the front of all the circuit's programmes. The Manager at the time, retired Major C. L. Hodgkinson ( whom Lord Grade in his book "Still Dancing" promoted to Lieutenant Colonel,) was also the Empire's musical director. - Courtesy Alan Chudley. 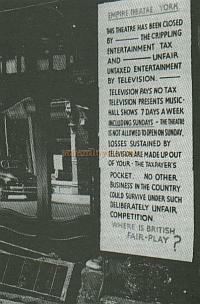 Left - A notice outside the York Empire in 1956 when the Theatre was forced to close due to Entertainment Tax. - Courtesy Alan Chudley. 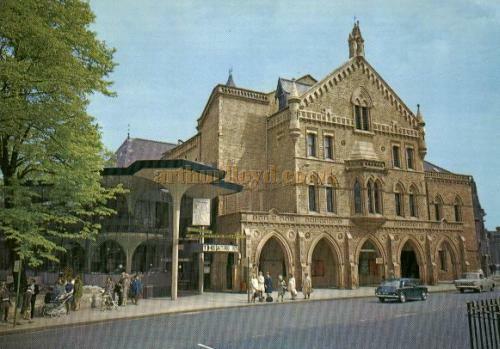 In 1958 the Theatre was bought by Shepherd of the Shambles and renamed the S. S. Empire. At this time the auditorium was reconstructed, removing the Stalls Boxes and Stage and flooring over the Stalls so that the space could be used for Roller Skating, Dancing, Bingo and Wrestling. In 1987 the Theatre had a reprieve from all the Roller Skating and Bingo when it was bought by the India Pru Company who invested £4m into restoring the Theatre back to its previous incarnation as a live Theatre by reinstating the Stage and reconstructing and redecorating the auditorium back to its original design. At this time a new Foyer was also installed under the Stage. The Theatre was bought by the Ambassador Theatre Group in November 2009 and you may like to visit their own Website for the Theatre here. Some of the information about this Theatre was kindly supplied by Alan Chudley. 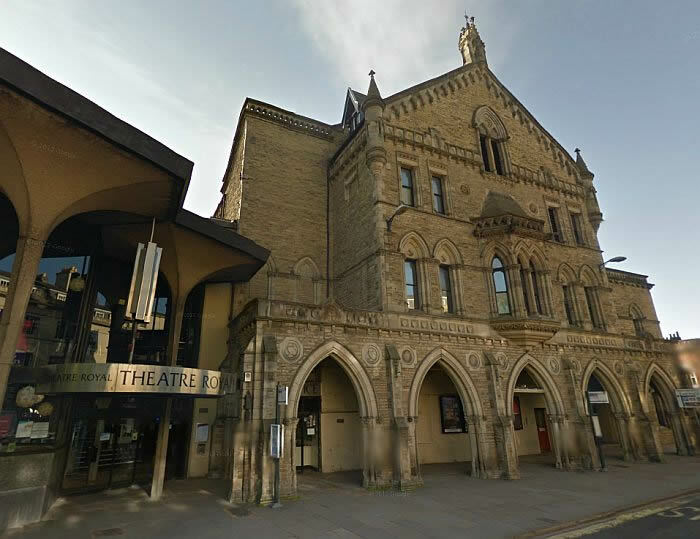 The Joseph Rowntree Theatre was built by Barry Parker in 1935 on a plot beside, and owned by, the Nestle Factory a few miles from the centre of the City of York. The Theatre opened on the 18th of November 1935 and was originally called the Joseph Rowntree Hall. Right - Advert for the York Light Opera Society's production of 'Songs from the Shows' at the Rowntree Theatre in 1996. - Courtesy Alan Chudley. The Theatre was built mainly for the factory's own workers and consists of a small steeply raked auditorium seating 450. 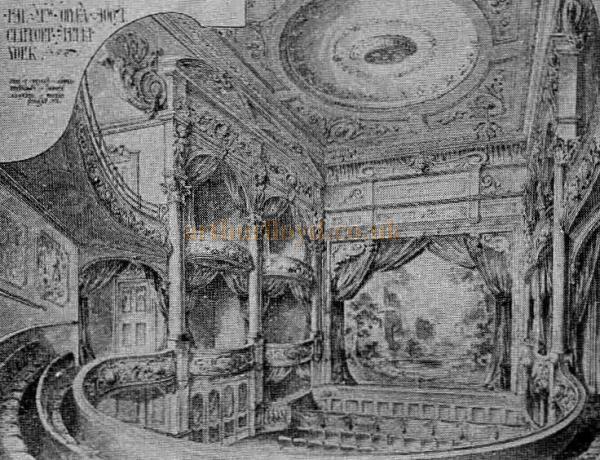 The Theatre, used mainly by amateurs, has a stage with a full fly tower that would be the envy of many other smaller Theatres. However, front of house space is very restricted. 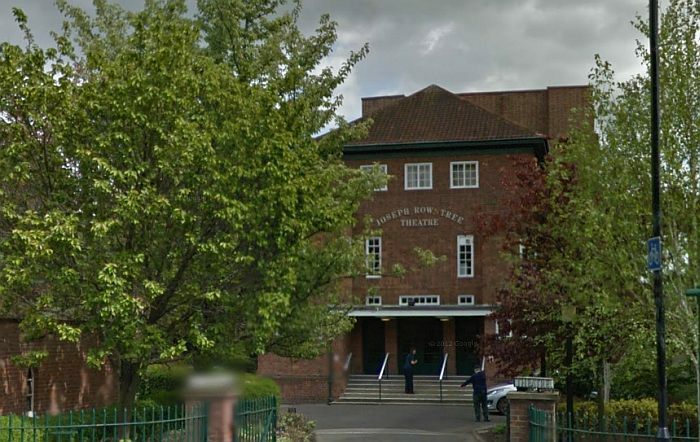 The Joseph Rowntree Theatre has been continuously operating since it was built, although it was closed to the public during the second World War when it was used for the war effort.